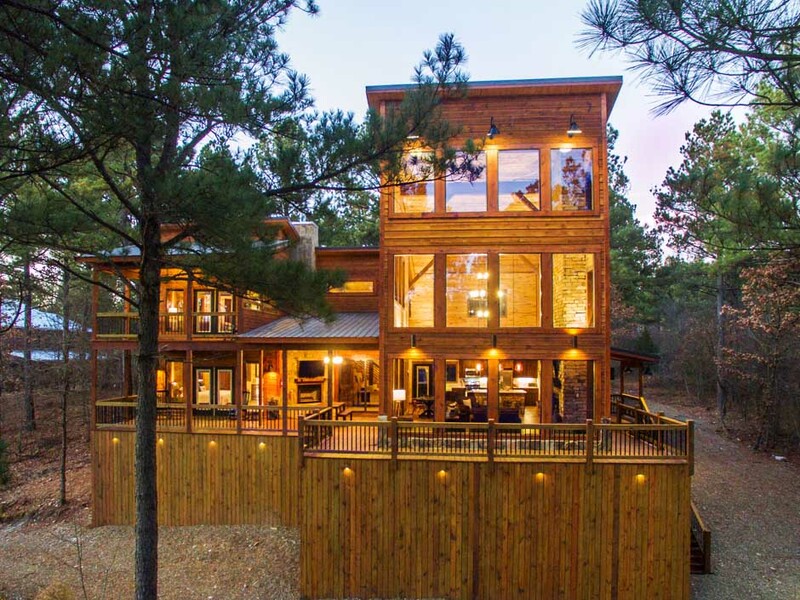 Rustic Luxury Cabins in Broken Bow OK offers the best of Broken Bow & Beavers Bend with luxury amenities, seclusion, and incredible experiences. Our Broken Bow luxury cabins are minutes away from Beavers Bend State Park and Broken Bow Lake. The cabin rentals are perfect for romantic getaways or family vacations. Each cabin features luxurious linens, hot tub, WIFI, & outdoor living spaces surrounded by nature. They are in unique locations with wonderful views and peaceful seclusion. Spend your trip relaxing in the hot tub watching your favorite movie with a glass of wine or explore all that the area has to offer. Either way, your vacation will be one to remember. Book your perfect vacation on our Reservation page today! Rustic Mountain Lodge in Broken Bow, Oklahoma sleeps 14 comfortably in two bedroom master suites, bunkroom, & upstairs bedroom has a 180° view of the treetops. Our cabin boasts over 2,700 square feet of deck spanning three levels. The cabin is set on the side of a mountain amongst majestic pines and hardwoods and a serene creek. Its rich and spacious interior features a grand living area with luxurious amenities, walk-in rain showers, hot tub, two fire pits and plush bedding throughout. Rustic Hollow cabin is a spacious 2 bedroom cabin that accommodates up to 6 guests. Rustic Hollow is an approximately 2,100 sq. ft. custom luxury cabin with over 1,000 square feet of deck space for entertaining and relaxing. Its rich and spacious interior boast a grand living area with floor to ceiling windows, large sliding glass doors and custom wood floors. The fully equipped open kitchen features quartz countertops, oversized gas cooktop and large peninsula with barstool seating for four. In the foothills of the Ouachita Mountains is Broken Bow Lake & Beavers Bend State Park. Broken Bow Lake covers 14,000 acres and has 180 miles of lush tree covered natural shoreline, which is perfect for boating, fishing, swimming and water sports. The forested terrain surrounding Broken Bow Lake is a haven for hikers and nature lovers. Mountain Fork River, which winds through Beavers Bend State Park, is hailed for its year-round trout fishing and countless water activities up and down the river. Whether you love great food, hiking in the outdoors, kids activities, or simply relaxing in your cabin, Broken Bow & Beavers Bend State Park has so much to make a memorable vacation for you and your family. Our rental cabins in Oklahoma are approximately 3 hours from Oklahoma City, Tulsa, Dallas & Fort Worth areas. For additional details and activities, go to our Directory & Map Page to see phone numbers & addresses and click below for our favorite things to do while in Beavers Bend & Broken Bow. Broken Bow Lake is tucked away in the foothills of the Ouachita Mountains and covers 14,000 acres. It has 180 miles of lush tree covered natural shoreline, which is perfect for boating, fishing, swimming and water sports. Beavers Bend State Park is an ideal place to spend the day hiking through and enjoying nature in Ouachita National Forest. There are gorgeous views of Mountain Fork River to take in from the trails. 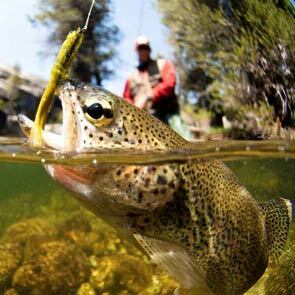 Bring your rod & reel and find your favorite fishing hole up and down Mountain Fork River or hire some of the best fishing guides out there to help you become the best angler in Oklahoma. The trained guides will take you on a zipline adventure that starts by guiding you through the canopies of the forest and ends with an incredible view over Broken Bow Lake. Rustic Luxury Cabins is proudly supports Friends of Beavers Bend. They are dedicated to conserving the natural beauty and sharing endless adventures of Beavers Bend for our friends, present and future.